Our Taj Mahal chicken coop was parked behind the barn over the winter. This gave us easy access to the chickens and provided a way to give them a protected area outside of the coop for eating and exercising. 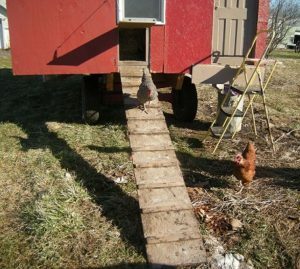 In late March it was time to move the coop away from the barn so that the chickens could begin their free-range activities. The chicken Taj Mahal in its winter location behind the barn. We used a chain to pull the Taj Mahal back through the cows’ muddy winter access path. Then we had to navigate out of the barn yard itself. Eggs are a staple in our home, and probably in many homes in America. Eggs are a quick and excellent source of protein. We have several couples that buy 2-3 dozen eggs a week, and that is their main source of protein throughout their week. In our home we use eggs by themselves as fried eggs, or hard-boiled or steam-boiled eggs; as the main dish in fried rice or magic quiche; as a part of a macaroni or potato salad; and as part of baked goods, like coffee cake, blueberry muffins, or cookies. Since we like to have an egg meal at least once a week year round, we also freeze lightly blended eggs during the spring abundance, so that we have them in the less abundant wintertime. Chickens that are raised outdoors in fresh air and sunshine produce good meat and excellent eggs. The eggs are sturdier, the yolks are brighter, and the cooked product is tastier than its barn-raised counterpart. Both are eggs, and both are good for you. But the ones from the chickens raised outdoors are better, and our customers regularly confirm this. In this last week of the April Egg challenge, use some local eggs, mine or someone else’s. Let me know what you made and how it tasted. And check out the recipes that others have shared in the comments of this post. We have recently begun steam boiling eggs, rather than hard boiling them. We googled it, looked at several recipes, and came up with this one. Bring eggs to room temperature. Bring about 1/2 inch of water in pan to a boil. Put the steamer pan in the top. Fill with eggs – our pan holds about 20. Put lid on pan and reduce heat to low. Steam for 20 minutes. (If you are steaming only 1 layer of eggs, then 12-15 minutes should be enough.) Remove eggs from heat and put in cold water. Sometimes we put ice in the water, but not always. Let sit for 15 minutes. Use any eggs you want. Use a pencil to mark the rest HB (hard boiled). Put in refrigerator until you want to use them. We use ours within 5 days, so they haven’t gone bad. Eggs are sturdy by themselves. So I would only hard boil enough eggs that would get used in 5 days. 2 tbsp minced cilantro, opt. Optional Step - Egg Pancake: There are several ways of adding egg to your finished fried rice. You can simply cook in the beaten egg at the end of cooking, or you can make an egg pancake. To do this, heat the pan and add 1 teaspoon of oil. Swirl in the oil to coat the bottom of the pan. Add a beaten egg and tilt the wok so that the egg covers the surface like a crepe. Cook the pancake about 30 seconds to a minute until it's just set. Use a metal spatula and flip the pancake and cook for 5 seconds or until set. Cut into small strips and add to fried rice near the end of cooking. Add the Carrots and Stir-Fry: Add the carrots and stir fry for 30 seconds, or until the carrots are bright orange. Add the Corn and Peas and Stir-Fry: Add the corn and peas and stir fry for 1 minute. Add 1 More Tablespoon Oil: Swirl the remaining tablespoon of oil into the pan. Add the Rice and Scallions and Stir-Fry for 2 Minutes: Add the rice and scallions stir-fry for 2 minutes, breaking up the rice with the spatula until it is heated through. Season the Rice: Season the rice with the salt and white pepper. Add the Sauce: Pour the soy sauce around the edges of the wok and stir-fry. Finish the Rice: Add the chopped egg pancake and pine nuts. Toss to combine. OR you can stir in 1 beaten egg. Stir-fry until the egg is no longer wet. Stir-Fried Rice in a 12-inch Skillet: If you are cooking in a 12-inch stainless steel skillet, halve the recipe to prevent rice from falling out of the pan. Substituting Other Vegetables: Substitute up to 2 1/2 cups of vegetables in place of the carrots, frozen corn, and frozen peas. Leftover meat (shredded or diced small) can also be added. Flour is mixed with eggs and milk. This cooks to form a crust as it bakes. This is based on the Magic Quiche recipe found in the Le Leche League cookbook, Whole Foods for the Whole Family. Salt or pepper or other herbs to taste, opt. Grease pie pan. Prepare veggies and meat. Place in bottom of the pan. Put grated cheese on top of veggies and meat. Blend eggs, flour, herbs, and milk. Pour over other ingredients. Bake at 350F for 50 minutes or until golden brown and knife inserted in center comes out clean. Have you been looking for locally grown food this year? This month’s challenge is to find and use locally grown eggs. It shouldn’t be hard this time of year. 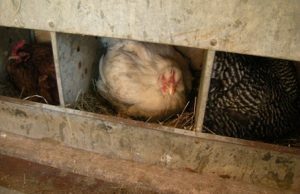 Any hen that is going to lay eggs will lay in the spring. We have a full refrigerator to support that claim! 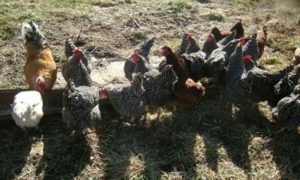 We have recently moved our chickens from the barn area to the grassy areas. We usually do this around March 15, but with the snow and muck this spring we didn’t get to do it until the 30th. So now our hens and roosters can have true free range and fresh air and sunshine. Here is a hen walking down the run to the ground. And here are some of the chickens eating their feed for the day. Fresh air and sunshine are an excellent combination for the production of most food. And raising layers outdoors leads to an excellent egg! We sell eggs by the dozen – $4.00 / dozen. Email us if you would like us to set some aside for you. Later this month I will give you some suggestions about how to cook with eggs. In the meantime, what do you make with eggs? Do you use locally grown eggs or free range eggs? How do eggs fit into your diet?